Glycosylphosphatidylinositol is a surface molecule important for host-parasite interactions. Mannosyltransferase (GPI-14) is an essential enzyme for adding mannose on the glycosylphosphatidyl group. This study attempted to overexpress the GPI-14 gene in Leishmania braziliensis to investigate its role in the antimony-resistance phenotype of this parasite. GPI-14 mRNA levels determined by quantitative real-time PCR (qRT-PCR) showed an increased expression in clones transfected with GPI-14 compared to its respective wild-type line. In order to investigate the expression profile of the surface carbohydrates of these clones, the intensity of the fluorescence emitted by the parasites after concanavalin-A (a lectin that binds to the terminal regions of α-D-mannosyl and α-D-glucosyl residues) treatment was analyzed. The results showed that the clones transfected with GPI-14 express 2.8-fold more mannose and glucose residues than those of the wild-type parental line, indicating effective GPI-14 overexpression. Antimony susceptibility tests using promastigotes showed that clones overexpressing the GPI-14 enzyme are 2.4- and 10.5-fold more resistant to potassium antimonyl tartrate (SbIII) than the parental non-transfected line. Infection analysis using THP-1 macrophages showed that amastigotes from both GPI-14 overexpressing clones were 3-fold more resistant to SbIII than the wild-type line. Our results suggest the involvement of the GPI-14 enzyme in the SbIII-resistance phenotype of L. braziliensis. Leishmaniasis is an important neglected tropical disease caused by at least 21 different species of protozoan parasites belonging to the genus Leishmania. The three main clinical forms of this disease are visceral (VL), cutaneous (CL) and mucocutaneous (MCL) [1, 2]. Leishmania (Viannia) braziliensis, which is broadly distributed in the Americas, is the etiological agent of both CL and MCL [3, 4]. It is estimated that 700,000 to one million new cases and 20,000 to 30,000 deaths occur annually due to leishmaniasis . CL is more widely distributed, with ten countries presenting the highest number of cases: Afghanistan, Algeria, Colombia, Brazil, Iran, Syria, Ethiopia, North Sudan, Costa Rica and Peru. Together, these countries account for 70 to 75% of CL cases worldwide . There is no vaccine available for humans; hence, chemotherapy is the main form of leishmaniasis control . Pentavalent antimonials (SbV) have been the drugs of first choice for the treatment in many countries for more than 70 years . In addition to their toxicity, pentavalent antimonials require long treatment schedules and present high rates of treatment failure (above 65%) in some places, such as the State of Bihar in India [8, 9]. The mode of antimony action is still not completely understood. It is accepted that SbV is a prodrug that is reduced to the trivalent (SbIII) form with a leishmanicidal effect against amastigote and promastigote forms of the parasite . Some studies have indicated that SbV inhibits glycolysis and fatty acid oxidation . Different antimonial-resistance mechanisms have been proposed, such as increased efflux/sequestration of active molecules, decreased drug reduction/activation, lower uptake, gene amplification and higher activity of repair mechanisms for damage caused by the drug . Lipophosphoglycan (LPG) and glycoinositolphospholipids (GIPLs) are glycosylphosphatidylinositol (GPI) anchored molecules that form a protective surface coat and mediate essential host-parasite interactions . Mannosyltransferase (GPI-14) is an essential enzyme for adding mannose on glycosylphosphatidyl. Mannose plays a key role in maintaining the energy and redox balance of Leishmania as well as increasing its virulence in the vector and macrophages . GPI-14 is functionally different from that of the mammalian pathway. Structural variations in the side chain and lipid moiety between Leishmania and humans make GPI-14 a rational drug target . In addition, this enzyme can be a good target for antiparasitic chemotherapy due to its role in the biosynthesis of LPG and GIPLs, which are important molecules involved in the parasite’s infection cycle. To the best of our knowledge, the role of GPI-14 on drug resistance mechanisms is not yet known. Thus, this study attempts to overexpress the GPI-14 gene in L. braziliensis to investigate the contribution of this enzyme in the antimony-resistance phenotype of this parasite. Promastigotes of Leishmania (Viannia) braziliensis (MHOM/BR/75/M2904) were grown at 26 °C in M199 medium supplemented as previously described . All analyses were performed with parasites in the exponential growth phase. In order to generate overexpression, a 1299 bp fragment corresponding to GPI-14 encoding region (open reading frame-ORF) (TriTrypDB accession number LbrM.30.1970) was amplified with Pfx DNA polymerase (Invitrogen, Carlsbad, USA) from L. braziliensis genomic DNA using the forward primer 5'-TGG ATC CCC ACC ATG AGC AAG GCA ACG TGG C-3' and the reverse primer 5'-TTG GAT CCC TAA ACC TCC TTG CGC GTC-3'. Bold letters indicate the Kozak sequence and the underlined sequences correspond to the BamHI restriction site. The next steps were performed as previously reported . Briefly, the GPI-14 1299 bp fragment was cloned into a pGEM-T Easy® vector (Promega, Madison, WI, USA) and confirmed by sequencing. Subsequently, pGEM-GPI-14 was digested with BamHI enzyme and introduced into dephosphorylated pIR1BSD expression vector (kindly provided by Dr Stephen Beverley, Washington University, USA). Next, the constructs pIR1BSD (empty vector) and pIR1BSD-GPI-14 were linearized upon SwaI digestion, electroporated into wild-type L. braziliensis, and the colonies were obtained on semisolid M199 medium containing 10 μg/ml blasticidin (BSD). Quantitative real time PCR (qRT-PCR) analysis was performed to investigate the levels of GPI-14 mRNA in Leishmania clones, as described previously . The amount of GPI-14 cDNA in each sample was normalized to that of the DNA polymerase gene. In order to investigate the expression profile of the surface carbohydrates of these GPI-14-transfected clones, the mean fluorescence intensity was analyzed by flow cytometry of the parasites incubated with the concanavalin-A (Con-A), a lectin that binds to the terminal regions of α-D-mannosyl and α-D-glucosyl residues. Briefly, promastigotes of L. braziliensis samples in the stationary growth phase (2 × 106 parasites/ml) were washed with PBS and incubated with Con-A lectin conjugated to fluorescein isocyanate (FITC) (Vector Laboratories, Burlingame, CA, USA) at a final concentration of 10 μg/ml for 30 min at 37 °C in a 5% CO2 incubator. Next, the parasites were acquired by flow cytometer (Fortessa LSR, Becton Dickinson BD, Franklin Lakes, USA) and the data were analyzed using FlowJo v.10 software. The geometric mean fluorescence intensity (gMFI) and the Con-A-labeled-Leishmania percentage (%) for each L. braziliensis sample were determined. Promastigotes of wild-type L. braziliensis and GPI-14-overexpression cell lines were incubated in M199 medium at 2 × 106 cells/ml in 24-well plates in the absence or presence of increasing concentrations (1.2–74.9 μM) of potassium antimonyl tartrate (SbIII) (Sigma-Aldrich, St. Louis, MO, USA) for 48 h. The effective concentration required to decrease growth by 50% (EC50) was determined using a model Z1 Coulter Counter (Beckman Coulter, Fullerton, CA, USA). Amastigotes of GPI-14-overexpressing L. braziliensis clones were also subjected to susceptibility assays with SbIII to analyze whether the antimony-resistant phenotype persists in parasite’s intracellular form. Briefly, human macrophages differentiated from THP-1 cells (ATCC TIB 202) were seeded (4 × 105 cells/well) on a 13 mm coverslip placed inside 24-well plates for 72 h at 37 °C, in a 5% CO2 atmosphere for macrophage adherence. Then, the adhered macrophages were exposed to stationary phase promastigote L. braziliensis samples (4 × 106 parasites/well) (10:1 parasites/macrophage). After 5 h of infection, the free parasites were removed and RPMI medium was added in the absence or presence of SbIII at a concentration ranging from 12.5 to 200 μM. After 72 h of incubation, adhered macrophages were stained by the panoptic method. The infected cells and the number of intracellular amastigotes were determined using ImageJ software (v.1.50i, Wayne Rasband National Institute of Health). EC50 values were obtained from three independent measurements in triplicate using the linear interpolation method . Data were analyzed using Student’s t-test, performed using the software GraphPad Prism v.5.0. A P-value less than 0.05 was considered statistically significant. The wild type L. braziliensis line was transfected with the construct pIR1BSD-GPI-14 to generate parasites overexpressing the enzyme GPI-14. This construct integrates into the 18S ribosomal DNA small subunit locus, by homologous recombination . After two weeks, the genomic DNA from the transfected clonal lines was subjected to PCR analysis with primers specific for BSD marker that confers resistance to blasticidin. The results indicated the presence of a 399 bp fragment in all blasticidin-resistant clones (data not shown), confirming successful transfection. It is important to highlight that GPI-14-overexpressing clones showed similar growth curves in comparison with the wild-type L. braziliensis (data not shown). These clones were subjected to quantitative real-time PCR in order to confirm overexpression of the GPI-14 enzyme. The results showed that GPI-14 transcription levels were 23.5- and 19.8-fold higher in the transfected clones C4 and C10, respectively, derived from the wild-type L. braziliensis lines than in the non-transfected or empty vector transfected (LbBSDØC1) ones (Fig. 1a). We also investigated the expression profile of the surface carbohydrates in GPI-14 transfected clones by percentage and geometric mean fluorescence intensity (gMFI) through flow cytometry of the parasites incubated with concanavalin-A (Con-A) (Fig. 1b). The results showed that clones transfected with GPI-14 express 2.8-fold more mannose and glucose residues than the non-transfected (LbWT) or empty vector (LbBSDØC1) transfected L. braziliensis lines, showing effective GPI-14 overexpression (Fig. 1c). A similar parasite percentage of Con-A for each Leishmania sample was observed, indicating the homogeneity of the parasites regarding the expression of molecules containing mannose or glucose residues (Fig. 1d). However, the mean fluorescence intensity was higher in the GPI-14 overexpressor clones, indicating that GPI-14-overexpressing clones presented higher mannose/glucose expression (Fig. 1c). Further to this, we investigated whether overexpression of the GPI-14 gene contributes to the antimony resistance phenotype in Leishmania. For this, clonal lines from L. braziliensis promastigotes transfected with constructs pIR1BSD (empty vector), pIR1BSD-GPI-14 and non-transfected parasites were incubated with different SbIII concentrations. The EC50 was determined by counting the number of parasites grown in the absence or presence of this drug. The data indicated that the SbIII EC50 values of non-transfected (LbWT) and empty vector transfected L. braziliensis lines were 7.4 and 7.0 μM, respectively, whereas clones 4 and 10 showed EC50 values of 77.8 and 17.8 μM, respectively (Fig. 2a, d) (Table 1). This result demonstrates that these clones were approximately 10.55- and 2.41-fold more resistant to SbIII than the non-transfected wild-type Leishmania line (LbWT), respectively (Fig. 2d). To analyze whether this antimony-resistant phenotype persists in parasite’s intracellular form, amastigotes of GPI-14-overexpressing L. braziliensis clones were also subjected to susceptibility assays with SbIII. The data showed that the numbers of infected macrophages (Fig. 2b) (Table 2) and amastigotes/100 infected macrophages (Fig. 2c) (Table 2) were higher in the GPI-14 overexpressor clones 4 and 10 than those in the non-transfected wild-type Leishmania line. The amastigotes from both GPI-14 overexpressor clones were about 3-fold more resistant to SbIII (EC50 values of 91.4 and 95.3 μM for clones 10 and 4, respectively) than the wild-type line (EC50 30.8 μM) (Fig. 2e). 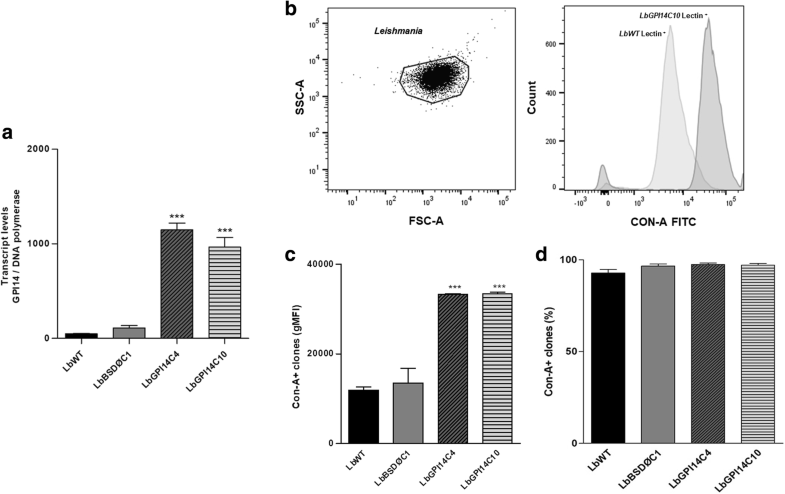 No difference in the infectivity of macrophages was observed among wild-type L. braziliensis line and GPI-14 overexpressor clones in the absence of SbIII (Fig. 2b, c). Chemotherapy for leishmaniasis presents several problems, such as high toxicity, long treatment schedules, and the occurrence of resistant strains to pentavalent antimonials. Therefore, the need to identify drug resistance mechanisms and new molecular targets for chemotherapy of this disease is necessary. It is well established that Leishmania spp. synthesizes a unique class of molecules known as phosphoglycans (PGs), including the membrane-bound lipophosphoglycan (LPG) and secreted proteophosphoglycan (PPG). PGs are essential for host-parasite interactions, such as infectivity and survival of the parasite in the human host, interaction of parasite in the host’s gastrointestinal tract, proliferation, and evasion of the vertebrate host’s immune system, amongst others [12, 20–23]. The important feature of LPG is the presence of 15 to 30 copies of a disaccharide-phosphate repeating unit Gal(β1,4)Man(α1-PO4), which is also found in many other molecules, such as secreted acid phosphatase, phosphoglycan and proteophosphoglycan . Studies have shown that LPG repeating units are involved in the parasite’s infectious cycle [24–27]. This repeating unit named PG domain is assembled by the sequential action of the α-D-mannosylphosphate transferase (MPT) and 1,4-β-galactosyltransferase (GalT) enzymes. The MPT , also named mannosyltransferase (GPI-14) , is an essential enzyme for adding mannose on the glycosylphosphatidyl. This enzyme transfers an intact α-D-mannose-phosphate moiety from the nucleotide sugar donor GDP-Man to the glycan substrate . Thus, the role of GPI-14 in the antimony-resistance mechanism was investigated in this study, given there is no previous data on this in the literature. After stable transfection with pIR1BSD-GPI-14 plasmid, L. braziliensis clones showed an increased GPI-14 mRNA expression level. In order to investigate the expression of mannose residues on the surface of these parasites, we analyzed the agglutination profile using a lectin of plant origin, concanavalin-A. Lectins, due to their interactions with specific carbohydrates, have become useful tools for elucidating cell surface differences. Studies reported the agglutination of Con-A with ligand terminals similar to α-D-mannose and α-D-glucose present on the membrane surface of L. braziliensis . Our results showed that L. braziliensis clones expressed 2.8-fold more mannose and glucose residues compared to the wild-type parental line, showing effective GPI-14 overexpression. Interestingly, an antimony susceptibility test using promastigotes showed that two clones overexpressing the GPI-14 enzyme are 2.4- and 10.5-fold more resistant to potassium antimonyl tartrate (SbIII) compared to the parental non-transfected line. Infection analysis using THP-1 macrophages showed that amastigotes from both GPI-14 overexpressor clones were about 3-fold more resistant to SbIII than the wild-type line. These results suggest that the GPI-14 enzyme may be implicated in the SbIII-resistance phenotype of L. braziliensis. The SbIII-resistance mechanism in Leishmania is complex, multifactorial, and involves several pathways, including the entry, metabolism, efflux and/or drug sequestration . The major entry route of SbIII in Leishmania is through aquaglyceroporin 1 (AQP1), a six helices plasma transmembrane pore forming protein . Downregulation, mutation and/or deletion of AQP1-encoding gene have been clearly associated with Sb resistance . We hypothesize that GPI-14 overexpressor parasites presenting a larger LPG with more mannose residues could protect these parasites from SbIII by sterically hindering the macromolecules’ access to the cell membrane, thus preventing entry of SbIII into the cell. Consistent with these data, it has been shown that LPG presenting a high number of repeating units protects Leishmania from complement-mediated damage, inhibiting channel formation and lysis by the C5-9 membrane attack complex . As a prerequisite for the biosynthesis of mannose(Man)-containing glycoconjugates in Leishmania, phosphoglycans including LPG and PPG are an ample supply of the mannose donors GDP-Man and dolicholphosphate-Man. Loss of expression of all Man-containing glycoconjugates in L. mexicana by targeted deletion of the genes involved in GDP-Man biosynthesis, such as phosphomannomutase and GDP-Man pyrophosphorylase, resulted in the complete loss of virulence in macrophages and mice [34, 35]. In contrast, L. mexicana dolicholphosphate-Man synthase gene deletion mutants presented defects in LPG, protein GPI anchor, and GIPL biosynthesis, yet retained the capacity to synthetize mannose and remained virulent in the macrophages . These data indicate that mannose activation leading to GDP-Man is a virulent pathway in Leishmania. Our results showed that the infectivity of GPI-14 overexpressor L. braziliensis clones in THP-1 macrophages was similar to that of the wild-type parasites, revealing that higher mannose residues had no effect on virulence. Conversely, the presence of 2.8-fold more mannose residues in these lines overexpressing GPI-14 contributed to antimony resistance (Fig. 2b, c). GPI-14 is a rational target for leishmaniasis chemotherapy since it is a key enzyme in the biosynthesis of LPG and GIPLs, which are important molecules in the parasite’s interaction with vertebrate and invertebrate hosts and has a structural variation in the side chain and lipid moiety compared to humans . Ruhela et al. described the synthesis and evaluation of new iminosugars as inhibitors of GPI-14 using microsomal membranes from L. donovani. Interestingly, another group developed eight derivative compounds that were docked onto GPI-14 and proposed that these antagonists would block the GPI-14 biosynthesis process . These authors, through the use of modeling and molecular dynamics analysis, observed that GPI-14 of L. major presents multiple transmembrane regions. To our knowledge, this study is the first to show evidence that the overexpression of GPI-14 enzyme is implicated in the L. braziliensis SbIII-resistance phenotype. 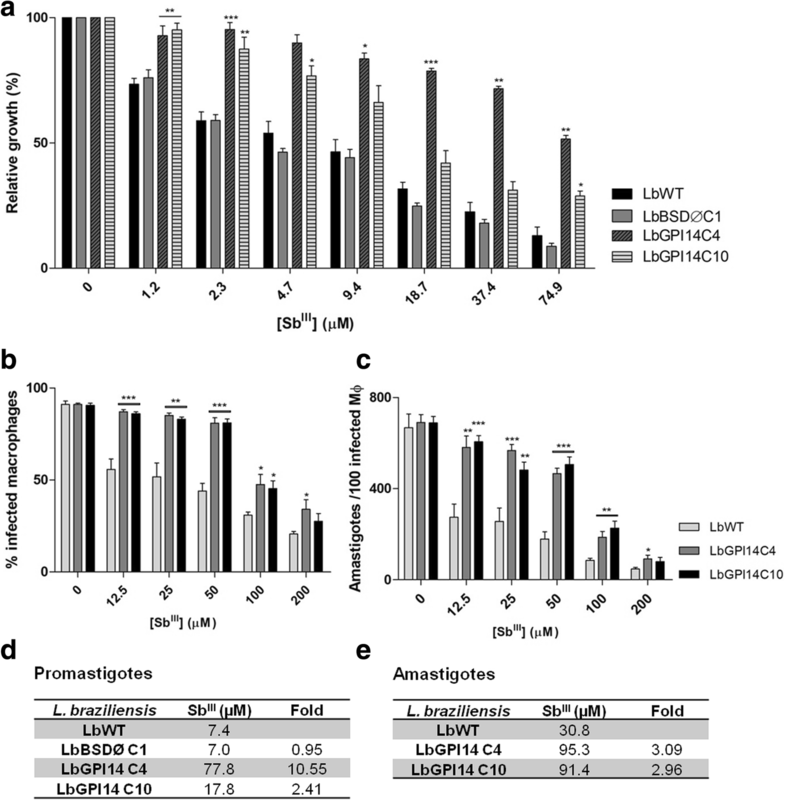 Since GPI-14 is a key enzyme in the biosynthesis of LPG and GIPLs, which play important roles in the parasite infectious cycle, it has significant potential as a target for new leishmaniasis treatment alternatives. Thus, the present study opens doors in the search for new membrane targets to be studied and raises questions concerning its role in the SbIII-resistance phenotype. Christiana Vargas Ribeiro and Bruna Fonte Boa Rocha contributed equally to this work. We thank Dr Stephen Beverley (Washington University, USA) for kindly providing the pIR1BSD expression vector. The authors wish to thank the Programme for Technological Development in Tools for Health-PDTIS-FIOCRUZ for use of its facilities. This study received financial support from the following agencies: Conselho Nacional de Desenvolvimento Científico e Tecnológico (CNPq), Fundação de Amparo à Pesquisa do Estado de Minas Gerais (FAPEMIG - CBB-PPM00610/15) and Coordenação de Aperfeiçoamento de Pessoal de Nível Superior, Brasil (CAPES). SMFM is a research fellow supported by CNPq (National Council for the Development of Research of Brazil), DSM and BFBR by CNPq, and CVR by CAPES. The funders had no role in the study design, data collection and analysis, decision to publish, or preparation of the manuscript. CVR, BFBR, DSM, VPM and SMFM designed and performed the experiments, analyzed the data, and wrote and reviewed the manuscript. All authors read and approved the final manuscript. World Health Organization. Leishmaniasis. 2018. http://www.who.int/en/news-room/fact-sheets/detail/leishmaniasis. Accessed 10 Sep 2018.